We've been in Berlin since last night. The drive from the airport to the hostel did not show too much of the "cool Berlin" I'd heard so much about and was hoping that the rest of our stay would show otherwise. The A & O hostel is pretty nice. The ground floor contained the dormitory-style rooms and there were obviously many school groups there, as the floor was filled with many teenagers. We got a twin room and this was located on the 5th floor. Our room is a model of efficient design. The floor and most of the furniture are made from something resembling pinewood. The bathroom is extremely small, but contains everything you need built into the tiniest space ever. Both the bedroom and the bathroom are scrupulously clean, which I LOVE. I swear there isn't a speck of dirt anywhere. Some dodgy hotels, which I've stayed in need to take a leaf out of their book. Last night we walked about 15 minutes from the hostel to find somewhere to eat and, after walking through a very dark and distubingly quiet area, came across a busy neighbourhood filled with street after street of bars (do Germans eat at all, I started to wonder). Luckily, we found a Chinese restaurant and although the way the chicken fried rice was prepared differed from the familiar, it was still good. Today we counted on the guided tour included as part of our hostel "First time in Berlin" package to take-up a good part of the day. However, no one at the hotel seemed to know about it, so we walked to the nearest train station and made our way to the Zoological Garden station, from where we got the bus #100, which is a cheaper way to see many of the city sites. There is no witty guide, taking you through the sites, so you either have to take a guidebook with you or hope that some kind and knowledgeable person points out some of the city landmarks to you. Luckily, my sister and I scored in the latter department. The area near the Zoo station is the hippest place we have been to here, as yet. Some of the shops are familiar; some others are not, but the area is very vibrant with many outdoor restaurants and lots of people strolling down the tree-lined streets. Okay, this keyboard is driving me mad. The "y" is in a different place from where I'm used to finding it, as are some of the other characters. So, I have to keep stopping to look for things. I haven't felt this way since forever. Okay, maybe my next entry will be from Paris. 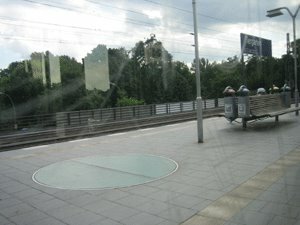 This was taken on the S-Bahn (surface train). This was our oh-so-clean room in A & O Hostel, Mittre. Yesterday, while still in London, Ayoola and I made our way to the "Carol's Daughter store"- painfully! It had gotten much warmer than we anticipated and weighed down by our coats and slowed down (at least in my case, by shoes highly unsuited for walking), we slowly made our way to the "store" (notice the use of the double quotes). When we eventually found the store, I was instantly suspicious, as the store did not have a sign boldly proclaiming it to be the London branch of Carol's Daughter. It turned out to be a privately-owned store, whose owner had bought some CD products the last time she was in New York. They had run out of all the best CD products, as far as I was concerned, (I mean, I didn't walk all that way just to buy foot cream). Also, the lady in the store didn't know when next (or if at all) they would get some more products. And we walked all that way for THAT???????????? Okay, this keyboard is REALLY driving me mad. My next entry will be from Paris. I hope their keyboards are easier for me to use. My sister and I are now in London, barely 2 (or 3) weeks after last being here. We'll be here for a few hours, before leaving for Berlin. We got the Heathrow Express into central London. Taking the underground would have definitely been the cheaper option, but at least, we did get into Paddington station in just 15 minutes flat. Many shops were still closed when we arrived in Bayswater (about 8:30am), but we were able to get SIM cards for our cellphones. It took a while to install and activate them and make sure that our phones were working properly, by which time more shops had opened. We headed for the internet cafe, which is where we are now (obviously). We'll do some bank stuff and after that will be free to spend our available few hours how we please. Apparently, Carol's Daughter (the natural hair and skin care shop) has opened a UK branch. I always wanted to visit their Brooklyn store whenever I was in New York City, but I never had enough time. So, I'm really looking forward to stocking up on as many hair products as my budget and suitcase will allow (bearing in mind that this is only the first day of our vacation). Here I am at Cool Cafe with barely 8 minutes left on the time that I paid for, so again, I'll have to make this super-brief. We got our Schengen visas today and so will be leaving for Europe tonight (England, Germany, France and Spain). I've been looking forward to this trip all summer. It's been cut short from what I initially had in mind- from 2 1/2 weeks to 1 1/2 weeks, but it'll be fun still. Hope we don't get tired out from all the plane hopping that we'll have to do. We wanted to complete some of the legs by train, but with the limited time we had, plane was much faster. Maybe next time. I'll be trying to write from each of the cities we visit. Will try!!!!! I just checked Nappturality.com, one of my favourite websites, which is all about natural hair, only to discover that the fifth cycle of America's Next Top Model will be starting soon in the States. I love this show!!! I didn't particularly like the last season- I thought it was filled with highly unmemorable characters. Naima, the winner, was sweet but no one's yet to live up to Eva the Diva in my book. I forgot about the new Fall line-up. I used to really look forward to it (I know, I'm so sad). Now, I'll be missing out on all the new seasons of my favourite shows like CSI (the Las Vegas version), the Apprentice, the Amazing Race (though I'm not sure when the new season of that starts). Luckily, we have DSTV which supplies us with many of the shows that I used to watch. Some are a season behind, but who's complaining? Besides, once I start work, I might not have the time of the day for TV. I want to make an additional post about hair. I don't know why Nigerian women almost never seem to wear their own hair. This is something that I've always observed, but of course I'm noticing it a lot more since I've been back. I've never particularly liked "having things" in my hair i.e. wearing extension braids or weaves. Even way back when before I left the country and before I went natural, I always thought that it was important to cultivate my own hair and learn to look after it and style it as best as I could. I taught myself to set my hair with rollers while still in England. It was too expensive for me to go up to London (about an hour-long train ride away) and then I saw my friend Tangela roll her own hair with excellent results. I knew then that I had be more self-reliant in taking care of my own hair. I became pretty good with that. When I went natural, I had to start learning how to care for my hair all over again and I feel that I have reached a place where I really know my hair; and I feel that my hair is all the better for it. Now my mother keeps looking at my hair and making comments about more conventional hairstyles. What does that mean, I wonder? Braids, weaves? I think those are good occasional style options, but not permanent style choices- for me. I think the overall reaction to my twists has been positive. Of course, these are not reactions from my future employers or colleagues. That might be a totally different matter and might matter more. I personally don't see what my hair style choices have to do with the quality of my work. I've been girding myself for a situation where I will be asked to wear a more traditional style, but I'd like to think that my future employers would not be so narrow-minded as to make that request. But, back to society in general- why is it so strange to want to wear your hair in its natural form? I've heard the whole "manageability" explanations, but I don't think it's just a case of natural hair being too difficult to comb and care for. I think it's a lot deeper than that. I think there's a thinking that natural hair is for kids. Grown women should have more sophisticated styles, and this is usually synonymous with straight, shiny hair. I have to admit though, as an ex-permie, that thinking of natural hair as a viable adult hair option requires a new way of thinking- one that doesn't associate elegance with straight hair. I had to go through that after my hair fell out and I was forced to go natural. I think seeing more and more people with natural hair helps to gradually regard natural hair as more normal. My brother says that more and more women are wearing their hair natural, though I am yet to see them. But, if this is true (and I hope it is), my afro won't receive so many stares as it does now. I went to Abuja this week to register for my National Youth Service. This is a period of work, which lasts a year long, and is dedicated to the government, so to speak. It doesn't mean that you have to work in a government organization or in civil service do. Some people do, but many find their own jobs and use that to serve out the youth service year. I hadn't been to Abuja in about 5 years and was excited to go back. I remember it as being rather dull, especially in comparison to Lagos, and was curious to see if I still felt the same. Abuja is definitely still more laid-back than Lagos. I think of it more as a town than a city. Almost the first sight we saw as we drove out of the airport though was of an accident scene. A man lay face-down on the ground, surrounded by a car, a motorcyle and, of-course, the inevitable bystanders. He was moving slightly and it appeared that he might have been riding on the motorbike and was knocked off by the car. Despite this disconcerting event, this didn't seem to represent the state of Abuja traffic. 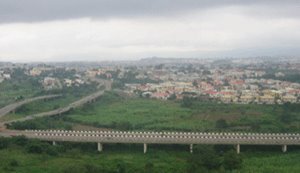 Abuja roads, unlike Lagos, are mostly highways (the less prominent streets are mostly found in the residential areas). There are also less people in Abuja and Lagos and as a result, there is just a whole lot less traffic. I enjoyed being a car that sailed freely down the streets, unemcumbered by other cars. Abuja is very unspoilt, with a lot more greenery on view than in Lagos. I'm hard pressed to name many areas of Lagos with large expanses of vegetation. Abuja is aso still a very clean city. Although, I've always considered myself a city girl, Boston really mellowed me out and I could see myself settling quite nicely in Abuja. The buzz of a big, cosmopolitan city is always attractive,until you have to spend hours in traffic everyday. Bird's Eye View of Abuja. It looks so peaceful doesn't it? On our second day there, my sister and I were given a tour around Abuja by my parent's driver. We drove by the Children's Zoo, saw Aso Rock (the rock, not the presidential residence), Millenium Park, the National Assembly, the Central Bank, several government and ministerial buildings, which I can't remember, the major hotels (Nicon Noga Hilton, Sheraton and the Meridien), the International Conference Center. I took a lot of pictures and would like to get them online, but the connection is so slow that it would take me forever. We stopped by at the Sheraton for lunch. I ordered suya, which turned out not to be suya at all, but nicely spiced meat. I could have made that myself. Of course, if I wanted real suya, the Sheraton was probably not the place to go to. We tried out the Meridien for dinner and that was pretty good. At least, the Nigerian food on offer there had a much more authentic taste. We returned to Lagos the next day and I wasn't overly thrilled at returning to the traffic of Lagos. We spent about an hour in slow-moving traffic in an area that should ordinarily be about 15 minutes away. Sigh!! The "charms" of Lagos driving, I guess. I'm in Lagos now. What a jet-setting life I lead- or so it seems. I've been on 3 different continents in as many weeks. Woohoo! Anyway, I got in two nights ago and Lagos feels and looks pretty much as I left it, but then I was here last in March. So not too much can have changed, or am I wrong? Perhaps not, as Lagos is a rapidly evolving city. And this makes a very exciting place to be. Again, I'm at a cybercafe, Cool Cafe, as the internet connection we have at home is excruciatingly slow. I have 10 minutes left of the time that I paid for, so I'll have to make this brief. I'll be starting work on the 19th of September and have a few weeks in between to get acclamatized to Lagos and, most importantly, REST!!!!! I think rest badly and have been making great strides in getting as much as I can over the last week. I'll write more as soon as I can. I'm in London now! I got here this morning. This is the first part of my return home. My sister and I will be here for 6 days, before going on to Lagos and then back to Europe for our real holiday. This trip was mostly to attend a friend's wedding. It's nice to be here and done with packing, selling, moving and the first part of travelling. I was worried about having excess luggage and having to pay for it at the airport. So, I got to the airport as early as I could. I still ended up paying the excess fee anyway. Now, I'll have to figure a way to move some of my luggage to another suitcase. I'm planning on meeting up with friends while here, but I'm not here that long and I think I might have contacted too many friends for the short period that I'll be here. Well, we'll see how it goes. I've been meaning to talk more about how hellish an experience my move was and how Uzo helped me out a great deal with- esp. doing a lot of heavy lifting that I'd have had to do myself (and hating every second of it)!!! But, there have been a lot more other things to write about, so maybe I'll talk about that later. Anyway, London is the same as usual-so far! We haven't really been ayway as yet, just hung around the Notting Hill and Queensway area. Tomorrow, I guess we'll venture farther out. I t feels so wierd to be checking email from a cybercafe. I haven't done this in ages. I'm using the Kinkos in Harvard Square. It costs 25 cents per minute. I'm not sure if that's a good price or not. But what choice do I have really? There are public libraries, where you can access your email for free but I don't know any around here. Maybe I'll check where the nearest library is to Stella's place, which is where I'm staying since I moved out of my apartment.